When it comes to choosing a university, choosing to study abroad is a big step. It is far from home, it’s a different culture, and it can have its share of both opportunities and challenges. And it can have great rewards. 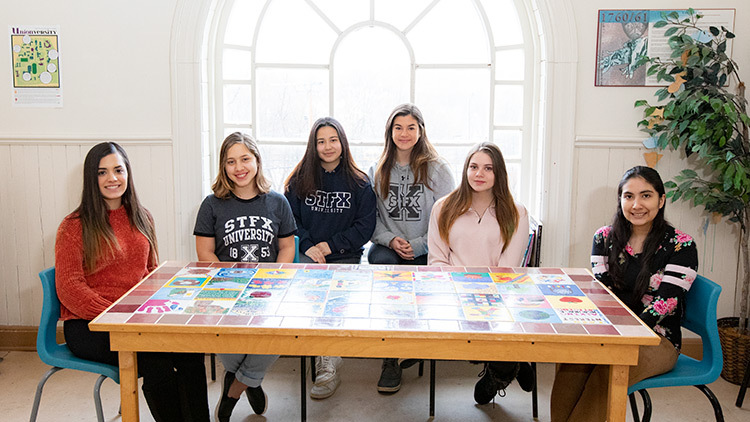 Currently, a group of over a dozen students from Ecuador, all from the city of Guayaquil, are studying at StFX, and the students says it’s been a great experience. “I have grown so much as a student, and a person. I have worked on skills I didn´t even know that I had, and the teachers are the best, always willing to help and super friendly,” says Rachell Alcivar-Meza, a third year double major human kinetics and human nutrition student. She says she first heard about StFX from a friend from high school, Nicky Barona, who shared her own personal experience of attending StFX. Ms. Alcivar-Meza says the university seemed like a good fit for what she was looking for. She also liked the academic programs offered. So far, she says her StFX experience has been amazing. Ana Maria Bejarano-Martinez, a first year human nutrition student, says several factors attracted her to StFX, including the fact that as a smaller university, she would be able to get the most personalized education possible, and that as a small university with small classes, located in a small town, the transition from high school would be less harsh. What’s her experience been like? “I have truly loved it. I really like the classes and how you can always go to your professors if there are any problems. I am also pleasantly surprised with the amount and quality of student resources for academics, wellbeing, recreation, career, etc. From friends’ comments even, I have noticed that here in StFX, there’s a huge concern for student wellbeing that I find really valuable,” she says. Andreina (Andie) Márquez de la Plata Gregor, a second year student taking a double major in sociology and psychology, says she heard of StFX through International Learning, and then did her own research on the university. “I fell in love with the campus, the city, and the program. Being from a big city, I wanted that change of scenery. Since as long as I can remember, I wanted the experience of living abroad, and university is the perfect excuse for doing that,” she says. “I do want to go back to Ecuador to be a social worker and hopefully be able to apply all that I’ve learned so far at X and Canada in general.